I am really behind in my ARC book reading and I’m working my way, somewhat randomly, through a backlist of books sent to me, this being one of those books. The story takes place at Arkwell Academy – a school for ‘magickind’ and … well, let’s stop right there. Yes – the comparison to a famous boy wizard with a lightning scar on his forehead will be made. And should be made! The differences, however, are enough to not confuse anyone. One of the biggest differences being that the characters are not just young wizards and witches in training but all sorts of magically inclined kids. Here, we focus on Dusty Everhart – a Nightmare … literally. Dusty is sent to invade the dream of one of the hottest guys in school (Eli), which is pretty embarrassing for the sixteen year old. But at the same time, sitting on his chest and slipping in to his dream is sort of (embarrassingly) arousing. But it’s much more embarrassing when he suddenly wakes up and sends her dream powers back onto her. That’s not supposed to happen. Ever. But that’s only the beginning. When the dream that Dusty saw in Eli’s head start coming true, there’s a deadly mystery happening on Arkwell’s campus and Dusty and Eli can’t help but get caught up in it. The opening sequence of this book, establishing Dusty, Eli, and Dusty’s abilities was tremendous. I was hooked and really looked forward to the rest of the book. I could see where teen readers (especially teen girls) would be really drawn to this book based in large part on this opening chapter. But given this opening, the rest of the book was just a tad of a let-down. The moments when Dusty’s or Eli’s magic abilities played a key role, were interesting and often gripping. But the rest of the mystery, around which this story is built, was boring. I liked Duty and Eli and I even liked Dusty’s Nightmare of a mother (literally), but I never quite bought in to what they were tracking down and why it mattered. There was something missing to let this reader buy in to the mystery. Overall, this was interesting enough that I’d like to read the other books in the series, but not so compelling that I’m rushing out to get any of the next books. Looking for a good book? 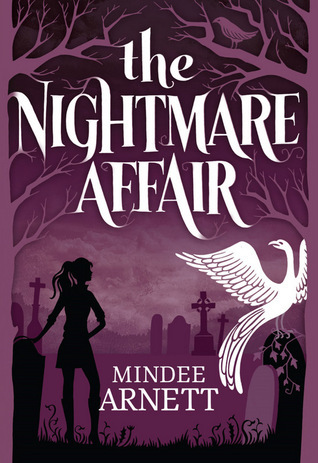 The Nightmare Affair by Mindee Arnett is a teen/YA mystery capitalizing on the magic school theme and offers some fun, interesting characters but lacks a bit in the mystery.